Summary: Use the push method or pull method to install federated search connectors so users can perform enterprise searches from Windows 7. Users can perform enterprise searches from a Windows 7 client by using federation. When a user types a search query in the search box in Windows Explorer, the Windows 7 client can retrieve search results from Microsoft SharePoint Server 2010 and display the results in the Windows Explorer window where the user typed the query. This article describes different ways that administrators and users can enable this search capability by installing one or more federated search connectors from SharePoint Server 2010 to the Windows 7 client. The article also compares the advantages of searching the enterprise from a Search Center in SharePoint Server to searching the enterprise from the Windows 7 client. In enterprise search, federation is the process of sending a search query to an external search results provider (such as a search engine), capturing the search results, and rendering those results locally for the user. In this process, a federation client requests search results by sending a search query and a federation provider delivers search results in response to the query. The OpenSearch v1.1 protocol is commonly used for federation. In this protocol, a federation client sends a search request in a standard URL format that the federation provider can recognize. The search results are aggregated on the federation provider server and the federation provider returns the results to the federation client in a standard XML format such as RSS or Atom. The federation client then acts like a client browser to render the search results for the user. The following figure shows the structure and flow of data from a federation client to a federation provider and back to the federation client, as specified by the OpenSearch protocol. For more information about the OpenSearch protocol, go to www.opensearch.org (http://go.microsoft.com/fwlink/p/?LinkId=198082). SharePoint Server has supported the OpenSearch standard, both as a federation client and a federation provider, starting with Office SharePoint Server 2007 with the Infrastructure Update for Microsoft Office Servers. To enable SharePoint Server to consume search results as a federation client, the search administrator can configure federated locations, which define how a search system gets search results from external content repositories. SharePoint Server can also provide search results to clients upon request according to the OpenSearch protocol. That is, the SharePoint Server search system can accept a search query from an external system in a URL and return search results to the external system in a searchable RSS feed. The Windows 7 client is another system that can act as a federation client by obtaining search results from external data sources by using the OpenSearch protocol. One source from which the Windows 7 client can obtain search results is the RSS feed of SharePoint Server. To enable the Windows 7 client to obtain search results from SharePoint Server, a federated search connector must be installed on the Windows 7 client. There are two main ways to do this: an end-user can install a connector (pull method), or a search administrator can install a connector (push method). Administrators can explain to users how easy it is for users to install a federated search connector from SharePoint Server to enable enterprise searches from the Windows 7 client. After a user submits a search query in a Search Center in SharePoint Server, the search system displays the results on a search results page. 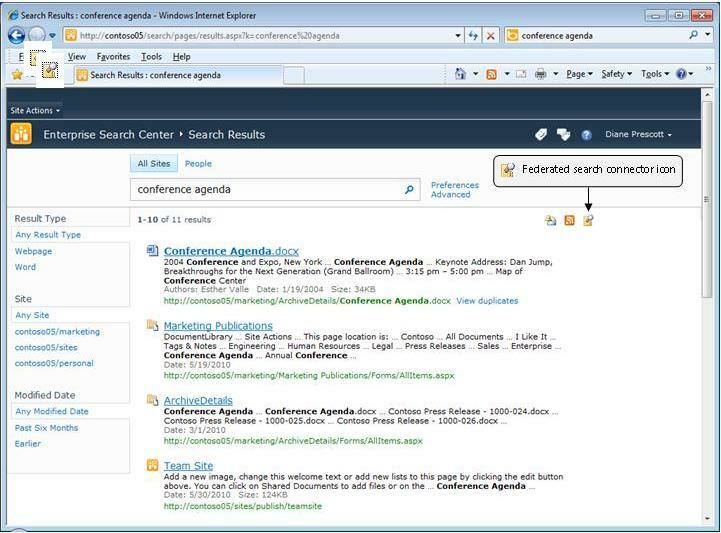 If the client operating system is Windows 7, the federated search connector icon appears at the top of the Core Search Results Web Part on the search results page, on the right side of the alert icon and RSS-feed icon. The following screen shot shows the federated search connector icon on a search results page. Generates an OpenSearch description (.osdx) file. This is an XML file that has Microsoft extensions. The file defines how to send a search query to SharePoint Server and how the search results will be presented in Windows Explorer. The .osdx file is the successor to the .fld file in Office SharePoint Server 2007. For information about .osdx file format and functionality, see Creating an OpenSearch Description File in Windows Federated Search (http://go.microsoft.com/fwlink/p/?LinkId=198085) and Federating Windows Search with Enterprise Data Sources (http://go.microsoft.com/fwlink/p/?LinkId=198087). The user can click Add or Cancel in response to the prompt. If the user clicks Add, Windows 7 opens the .osdx file and creates a Windows 7 federated search connector in the user’s Searches folder (drive:\Users\UserName\Searches), and a shortcut for that connector is added to the Favorites in Windows Explorer. At any time after that, the Windows 7 user can click that shortcut in Windows Explorer and then type any search query in the Windows Explorer search box to submit the query to SharePoint Server. SharePoint Server returns the search results and associated metadata (such as author and date), which are displayed in Windows Explorer where the user can view and interact with them. For any given query, the search results that are displayed in the Windows 7 client are the same as those that are displayed in the Core Search Results Web Part when the search is conducted directly in SharePoint Server. However, some relevance settings, such as Best Bets, might not be preserved when search results are displayed in the Windows 7 client. The following screen shows how federated search results are displayed in Windows Explorer. The scope of the search from Windows 7 will be the same as the scope of the last search that was performed in the Search Center in SharePoint Server before the user clicked the federated search connector icon. For example, if the scope of the last search in the Search Center was the user’s team site, that team site is the scope of the corresponding federated search connector shortcut for searches from Windows 7. To be able to obtain search results in Windows 7 with a different scope, the user must first perform a new search with a different scope in a Search Center in SharePoint Server, and then click the federated search connector icon on the corresponding search results page in SharePoint Server. This creates a federated search connector shortcut in Windows Explorer that has the new scope. An administrator can install federated search connectors from SharePoint Server onto Windows 7 clients by using a push method. 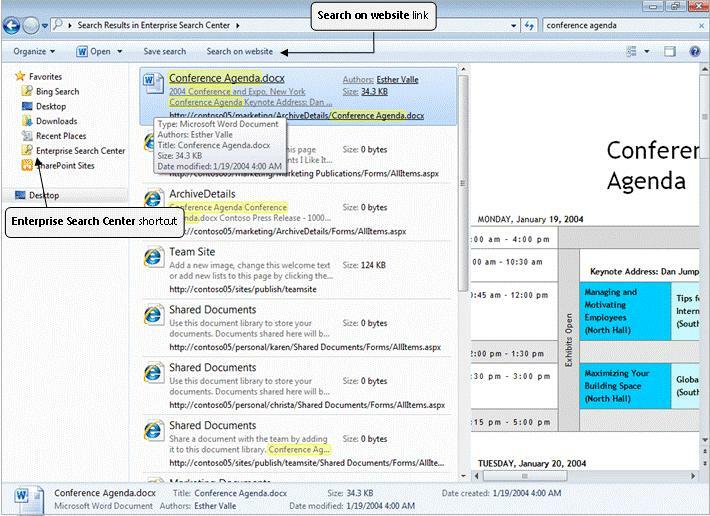 A federated search connector for a division-wide or company-wide search can be useful to employees and can thus be a good choice for pushing to many Windows 7 client computers at one time. An administrator can push a federated search connector to client computers in various ways, such as by using group policy or a logon script, or by adding the federated search connector to a desktop image. For information about creating .osdx files and deploying federated search connectors by using group policy, see Windows 7 Federated Search Provider Implementer's Guide (http://go.microsoft.com/fwlink/p/?LinkId=198088), and Creating an OpenSearch Description File in Windows Federated Search (http://go.microsoft.com/fwlink/p/?LinkId=198089). The following procedure describes another way that a search administrator can initiate deployment of a federated search connector from SharePoint Server onto Windows 7 client computers. In this procedure, the administrator creates an .osdx file and saves it to a shared document library. The administrator then sends an e-mail message to users that includes a link to the .osdx file and an explanation of what the link is for. When a user clicks the link in the e-mail, the system automatically creates a federated search connector in the Windows 7 file system and also creates a shortcut for the connector in the Favorites in Windows Explorer. We encourage search administrators to help educate users in this way about the ability to search the enterprise from Windows 7. Verify that the user account that is performing this procedure has Contribute permissions to a shared document library where .osdx files can be stored. Also verify that targeted users have Read permissions to the shared document library. Perform a document search from a Search Center in SharePoint Server — for example, a Search Center that is division-wide or company-wide. Right-click the federated search connector icon on the search results page. Click Save Target As and save the .osdx file to a convenient location on a local drive. Perform a people search on the same division-wide or company-wide Search Center. Upload each .osdx file to the shared document library. Paste the shortcut into an e-mail message. You might use hyperlink display text for each shortcut — for example, “Add a shortcut to Windows Explorer for company-wide document searches”, or “Add a shortcut to Windows Explorer for division-wide people searches”. When a user clicks a link in the mail, a federated search connector for an enterprise search is automatically created on the Windows 7 client computer, and a shortcut for that federated search connector is automatically created in the Favorites in Windows Explorer. A user can click the federated search connector shortcut in Windows Explorer and then type a search query in Windows Explorer to retrieve search results from the division-wide or company-wide Search Center that is associated with the federated search connector. The search results are displayed in the Windows Explorer window where the user typed the query. Performing enterprise searches directly in the SharePoint Server user interface is especially useful when a user needs to find information in a large corpus. When a user performs a search from a Search Center in SharePoint Server, the search results page typically includes a refinement panel that can help the user narrow the results by using the metadata that are returned with the results. In addition, in the SharePoint Server user interface, administrators can configure results ranking by using Best Bets and authoritative sites. Other features such as query suggestions and Did You Mean are also available to help the user find information. In contrast, features such as refinements and Best Bets are not available for results that are viewed in Windows Explorer by using a federated search connector that was installed by the pull method. (Refinement functionality can be manually added to the .osdx file in the case of the push installation method.) For this reason, searching the enterprise from a Windows 7 client can be most useful when a user wants to retrieve familiar information from a known small site instead of a large data store. For example, a user might frequently refer to a colleague’s technical specification that is stored on a SharePoint team site. In such a case, because the author and item location are known, availability of search refinements and other relevance settings is unnecessary. Administrators can communicate such considerations to users and encourage them to install federated search connectors for small sites where documents that they frequently use are stored. When viewing search results in Windows Explorer in Windows 7, users can expedite desktop interaction with Windows features such as file preview and drag-and-drop. For more information about federation features in Windows 7, see Federated search in Windows (http://go.microsoft.com/fwlink/p/?LinkId=198091). The RSS feed from SharePoint Server also provides a rich set of metadata for search results. Metadata can include images, icons, thumbnails, and videos. Finally, if the Windows Explorer interface does not provide the information and capability that the user needs, the user can click the Search on website link in Windows Explorer (see the previous screen shot) to open a browser tab to the SharePoint Server Web site where the federated search connector was created. On that site, the same query and search results are displayed and the refinement panel is available.